If you're considering using a supplement of argan oil, what do you need to know? What conditions is this supplement marketed for, and what do the studies say about its effectiveness? What are the possible side effects? Does it interact with any other medications? Argan oil is a natural product sourced from the kernels of the Argania spinosa tree (a species native to Morocco). Rich in essential fatty acids and antioxidants (including vitamin E, polyphenols, linoleic acid, and sterols), argan oil is often marketed as an anti-aging aid for the skin. In addition, consumption of argan oil is said to help with certain health conditions. Proponents claim that argan oil can treat a broad range of skin conditions, including acne, eczema, infections, and psoriasis. Additionally, argan oil is said to prevent and/or reverse aging-related damage when applied to the skin. A few studies have found that both topic argan oil and oral argon oil may improve skin elasticity in postmenopausal women. Argan oil is also frequently used as a massage oil. Argan oil is touted as a natural treatment for dry hair, split ends, and scalp-health issues (such as dry scalp and dandruff). Biotin is also often recommended for hair, with or without argon oil. Thought to strengthen nails, argan oil is sometimes recommended for treatment of brittle nails. 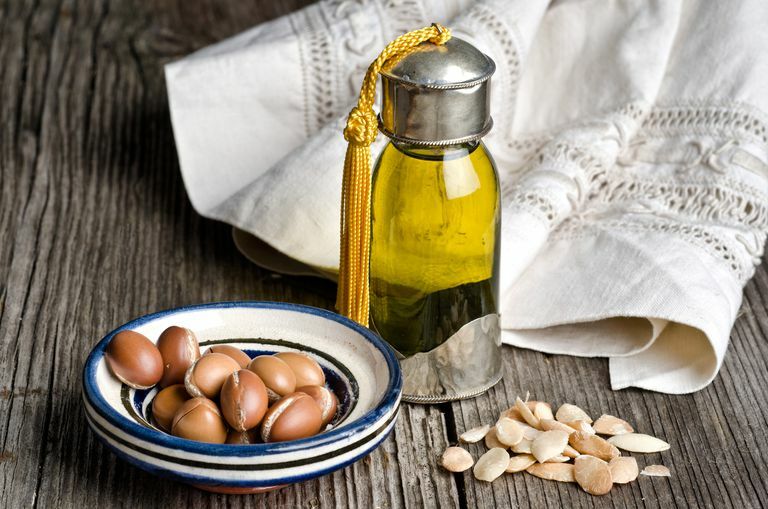 Some proponents suggest that consumption of argan oil can help treat or prevent certain health conditions, including osteoarthritis, high blood pressure, diabetes, and atherosclerosis. To date, few scientific studies have tested the effects of argan oil. While there is a lack of research on argan oil's benefits for skin, hair, and nails, preliminary studies indicate that argan oil may enhance health when taken orally. In tests on rats, for instance, scientists have shown that consumption of argan oil may fight insulin resistance, protect against obesity-related health problems, and lower blood pressure. One of the few clinical trials to test the potential benefits of argan oil, a 2005 report from Nutrition, Metabolism, and Cardiovascular Diseases found that use of argan oil supplements may aid in the prevention of heart disease. For the study, 60 young men consumed 25 ml of either argan oil or extra virgin olive oil every day for three weeks. Study results showed that both oils helped improve participants' antioxidant status (an effect that could help reduce cardiovascular risk, according to the study's authors). In another human study, oral argan appears to improve the lipid profile of people undergoing dialysis. A 2017 study in rats found that argan oil may have anti-seizure activity. In these studies it appeared to have actions on the hippocampus in the rat's brains which both increased the threshold for seizures (made them less likely to occur) and decreased the risk of death for rats which experienced status epilepticus. Topical argan oil has found to have some benefit in the healing of second degree burns in rats, and it's recommended that argan oil be studied (along with silver sulfadiazine) for the treatment of burns in humans. More research is needed before consumption of argan oil is recommended for prevention or treatment of any health condition. Since argan trees are native to Morocco, argan oil products are frequently referred to as "Moroccan Argan Oil." In Morocco, argan oil has long been used as a topical treatment for skin problems. Argan oil is used as an ingredient in a variety of personal-care products, including creams, lotions, serums, facial masks, shampoos, and conditioners. You can also purchase pure argan oil that includes no added ingredients. Argan oil and argan-oil-based products can be found in many natural-foods stores and specialty beauty stores, as well as in some drugstores. Some supplements such as the tocopherols present in argan oil may increase bleeding time (and should not be used for people on blood thinners,) but it's not known whether or not this would be a problem with argan oil alone. Argan oil has possible benefits, but it's important to separate this into topical and oral uses. Topically, argan oil is available alone as well as in combination in many skin care products. Studies are few, but have found some benefits of the use of argan oil for dry skin in postmenopausal women. While it has not yet been studied in humans, argan use appears to be efficacious in treating second degree burns in rats. Oral ingestion of argan oil is a different topic. Components of argan including known strong antioxidants suggest that it may have important uses, but the research is very young. Research on rats has found beneficial effects on lipids and has appeared to improve both lipids and antioxidant status is a few human studies. At the current time, medical research doesn't support the use of argan oil for the prevention or treatment of any health condition and further research is needed. If you're considering the use of argan oil for a health condition, make sure to consult your physician first. Self-treating a condition and avoiding or delaying standard care may have serious consequences. El Middaoui, A., Haddad, Y., and R. Couture. Beneficial Effects of Argan Oil on Blood Pressure, Insulin Resistance, and Oxidative Stress in Rat. Nutrition. 2016. 32(10):1132-7. Lizard, G., Filali-Zegzouti, Y., and A. Midaoui. Benefits of Argan Oil on Human Health—May 4-6 2017, Errachidia, Morocco. International Journal of Molecular Sciences. 2017. 18(7).pii:E1383. Sour, S., Belarbi, M., Sari, N., Benammar, C., Baghdad, C., and F. Visioli. Argan Oil Reduces, In Rats, the High Fat Diet-Induced Metabolic Effects of Obesity. Nutrition, Metabolism, and Cardiovascular Disease. 2015. 25(4):382-7. Veraldi, S., Mascagni, P., Tosi, D., and M. Brena. Allergic Contact Dermatitis Caused by Argan Oil. Dermatitis. 2016/ 27(6):391.